Colin Ingram says his biggest limited overs score of 130 for Glamorgan against Essex was "one of the best knocks" of his career. 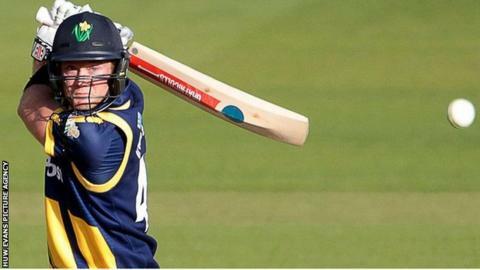 The South African's innings came just four days after he scored 109 against Kent and helped the Welsh county to a 146-run victory in the One Day Cup. The result leaves Glamorgan in contention for a quarter-final place despite a pre-season points deduction. "I've got a smile on my face, but there's hard work to come," he said. "It's always nice when the team's winning and it's great to spend some time in the middle." Coach Toby Radford also enjoyed the comprehensive nature of the win. "I thought it was one of our best games with bat and ball, and for Colin Ingram to get back-to-back hundreds was outstanding," he said. "We didn't have a great start but the partnerships he built held things together." Glamorgan have three points in Group A after two wins and a no result . Ingram shared significant stands with Aneurin Donald (37) and Chris Cooke (36) before Graham Wagg blasted 62 off 46 balls to take Glamorgan to 288-6 in their 50 overs. Previously unbeaten Essex were then dismissed for 142 in 37.1 overs. Ingram paid tribute to the team-mates who supported him. "We started off really slowly but credit to the other guys who came in and played positively in those circumstances, it allowed me to anchor down and bat through," he added. "It got a bit more fluent and I thoroughly enjoyed it, I think it was one of the best knocks I've played." Radford believes the team is taking full advantage of a run of six consecutive One-Day Cup games in the fixture list. "It's nice when you've got a block when all you're playing is 50-over cricket, you can plan it, practise it and then hopefully put it into practice." Glamorgan are back in 50-over action when Hampshire visit the Swalec Stadium on Sunday, with the visitors travelling to Wales straight after a game against Middlesex on Saturday. "There's nothing like momentum, we've got three or four players scoring runs and we're bowling as a unit... If we keep doing that we'll put good pressure on Hampshire," added Radford.